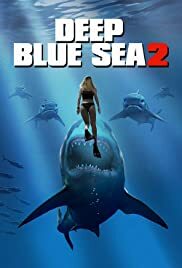 Searching for a cure to Alzheimer's disease, a group of scientists on an isolated research facility become the prey, as a trio of intelligent sharks fight back. When a lifeguard catches wind of a dangerous anomaly off the coast of San Diego, she commissions a band of unlikely heroes to assist her on a suicide mission to save the west coast from total destruction. Sharks attack a fish rodeo on the Mississippi River, and it is up to a group of locals to stop them. Trent Slater: Sharks don't eat nerds. Not the worst film that I have seen this year....but that's not saying too much. 1) A shark scientist who looks like a stripper (Or the director/producer's girlfriend) 2) Assorted people around to get eaten by sharks. 3) A billionaire who travels alone 4) A billionaire who apparently has only a single attorney 5) Zodiac boats used for traveling to locations way offshore 6) A shark trainer who doesn't seem to understand sharks. 7) A shark scientist who's also a pain in the a*s whiner 8) Zero suspense 9) Nobody who understands science working at the facility (You know...like physics) 10) Not a single character who you can care about. Terrible film that would have been better on Syfy as an Asylum project. Avoid,avoid,avoid. 18 of 20 people found this review helpful. Was this review helpful to you?